I’ve written so many editorials about Lucire’s history for our various anniversaries that now we’ve turned 15, I feel like I’d just be going over old ground. Again. I’d do it maybe for the 20th or 21st, but the story has been told online and in print many times. But 15 is a bit more of an occasion than, say, the ninth—so it deserves some recognition. The biggie this week is not so much that we have turned 15, but that we have officially announced a print-on-demand edition to complement our others in print and online, one that sees Lucire printed off as it’s ordered. It combines what we know—the digital world—with an analogue medium that everyone understands. It also gets around that sad reality that for every 1,000 copies printed, 500 usually wind up getting returned due to being unsold and pulped. In publishing, two-thirds sold qualifies as having “sold out”. And that’s not really that great for the first fashion magazine that the United Nations Environment Programme calls an industry partner. We’re also celebrating the Ipad and Android editions, which actually launched in August but we didn’t get an announcement out till September. We also débuted a PDF download via Scopalto in France, and there’s one more edition that we’ll announce before the year is out. So rather than look back—which is what we found ourselves doing at the 10th anniversary, at a time when the recession was about to bite and there was just an inkling of a fear that our best days were behind us—we’re now looking forward with some relish and wondering just how these new editions will play out. If I were to take a look back to 1997, it would be to remark that being the first (at least for New Zealand) does not necessarily translate to being the most profitable. You carve out a niche that no one else had done before, prove a point, and someone else makes it work a bit better. So is the lesson in commerce. It used to bug me but no more; we have a good record of doing things in a pioneering fashion, and when you look at Lucire, it’s one of the very few fashion titles from the original dot-com era that’s still being published today, and in more forms than we had imagined. We were always happy to put value labels right next to pricier ones in coverage or in editorials, because that is how real people dress, and because we based our coverage on merit rather than advertising budgets. We looked at the advertising market at a global, rather than regional, level, something which we see some agencies taking advantage of as greater convergence happens in that market. I like to think that some day, all magazines will be printed as we’re doing them, but from more bases around the world, to alleviate the burden on our resources. They’ll be, as I predicted many years back, mini, softcover coffee-table books, publications to covet, and be less temporary. (I also said newspapers will become more like news magazines, but I live in a city where dailies are still printed as broadsheets, which reminds me that predictions can often take a lot longer to be realized.) Features will dominate ahead of short-term, flash-in-the-pan news, a path which the 28th New Zealand-produced Lucire issue takes, and something foreshadowed by Twinpalms Lucire in Thailand five years ago. We’re also in a very enviable position with a cohesive team. You could say it’s taken us 15 years to find them. At 1 p.m. local time on October 20—15 years and one hour after we launched—our London team met to toast our 15th anniversary, while fashion editor Sopheak Seng, Louise Hatton, Michael Beel and Natalie Fisher worked on a photo shoot today in New Zealand for issue 29. Around the world, our team continues to deliver regular content, and I hope they’ll forgive me for not naming everyone as I fear accidental omissions. Just as I felt a little uncertain but excited about where things would lead with Lucire on October 21, 1997–the 20th in the US—I have a similar feeling today. And that’s a good thing, because if we’ve managed to get on the radars of millions in those last 15 years, I’m hopeful of the changes we can effect in the next 15. 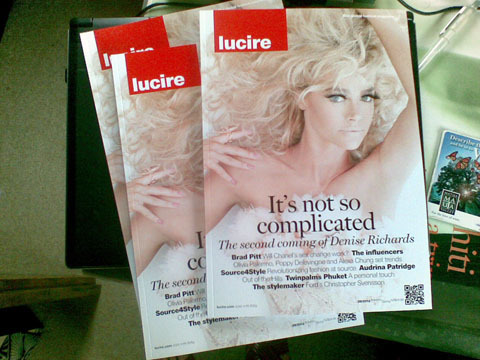 Above: Lucire copies get finished at Vertia Print in Lower Hutt.